Have you got two minutes ? Do you want to see and hear how badly we've been screwed by the Rail Cartel's puppet politicians -- both Democrats and RINO's ?? 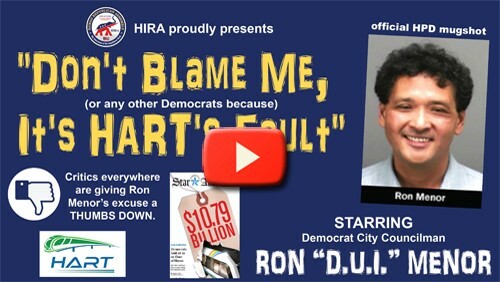 Check out HIRA's newest video starring Democrat City Councilman Ron "D.U.I." Menor . He lays all the blame on unelected bureaucrats at HART -- the semi-autonomous City agency which RINO Charles Djou's infamous legislation put officially created to take charge of building (and eventually running) the rail system thanks to former councilman Djou's apocalyptic City Council Resolution 09-252 . Doesn't that make you sick ? Longtime elected official and current city councilman Ron Menor makes excuse after excuse for why Democrats (like him) and RINO's are not to blame for all the problems with the rail project. The worst part is that, in shifting blame to HART, Menor is at least 99.9% right. That's because Djou's HART agency was charged with building rail and made a permanent part of Honolulu's City Charter for one reason and one reason only: So that Democrat weasels like Ron Menor and Kirk Caldwell and fellow RINO's like Kym Pine-Ryglowski could act like potted plants by saying "We don't have any responsibility for how screwed up the rail project has become. That's HART's job." WELL, THANKS FOR NOTHING, RINO CHARLES DJOU -- Thanks to your signature HART legislation, we're now stuck with your terrible HART agency plus overpriced rail and higher taxes and lame Democrat excuses and little recourse to fix (or stop) this boondoggle. Let's quickly turn our attention to the GIANT, PERMANENT TAX INCREASES which are coming soon and which will raise the cost of living in Hawaii even higher. Only months ago, Menor and his buddies on the City Council voted for a 5-year extension of the Rail Tax in order to raise another $1.8 billion (from you) for the bloated project. Well, these greedy politicians are slated to push for yet another big Rail Tax Extension right after the 2016 election. In fact, they're actually getting started in just a few days from now. This Wednesday , October 19th (click for agenda) , the Honolulu City Council's budget committee will be discussing Resolution 16-238 to extend the Rail Tax PERMANENTLY. They will be urging the Democrat and RINO-dominated 2017 State Legislature (convening next January) to approve a permanent GET hike so that the Honolulu City Council can rubber stamp that permanent looting of taxpayers. WARNING: There are currently enough pro-rail, pro-tax members of the city council to override ANY mayor's veto of this tax increase. So it doesn't matter if Djou or Caldwell are elected mayor, the tax hike is practically a done deal with the current mix of Democrats and RINO's on the council. HIRA has two solutions to this madness. 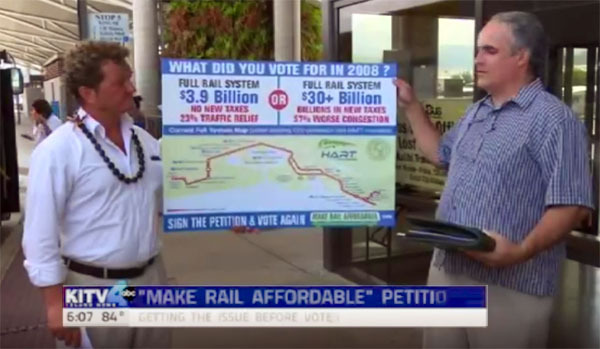 One is HIRA's petition campaign to put rail on the ballot again ; now that we know the truth about real costs, nonexistent traffic congestion relief, low ridership, phony job creation, and more. Voters would then have the power to reduce or eliminate the rail route altogether. That's Solution #1. With your kokua now and as we go forward, all Republicans can and must come together to fight the Democrat Machine so we can become the majority party in Hawaii. With our state GOP organization and leadership completely dysfunctional, broke, silent and neutral, HIRA is the right vehicle for that change. Please join us today so we can change Hawaii tomorrow. Thanks for your time, energy, attention and support. More announcements coming soon!